Community solar makes it possible for everyone to go solar, but Pennsylvania law currently does not allow it. There is a bill moving through our legislature to change this. Click here to urge your representatives to support community solar. With community solar, you can purchase or lease a “share” in a community solar project or start a project with your neighbors. Every month, you receive a credit on your electricity bill for the energy produced by your share. We believe that everyone should be able to go solar, whether on their home or through a subscription to a community solar project. Solar is a way to reduce your energy bills, save money, and live your values. Community solar began with a simple idea. People shouldn’t have to put a solar panel on their own roof to benefit from the electricity it generates. This idea is in the process of dramatically changing the way we get our electricity. In the digital age, it should be easy to take production somewhere on your local electric grid and attribute it to your utility bill account. Consumers no longer need to depend on analog wires and dials. Community solar, when done right, can provide solar access to everyone. The National Renewable Energy Laboratory (NREL) released a study in 2015 that examined community solar’s potential. NREL found that community solar could grow to nearly half of the solar PV market by 2020, if the market is allowed to fully develop. This is a critical question as community solar is currently only available in a handful of states. In order to change this, lawmakers will need to pass new laws and rewrite utility regulations. 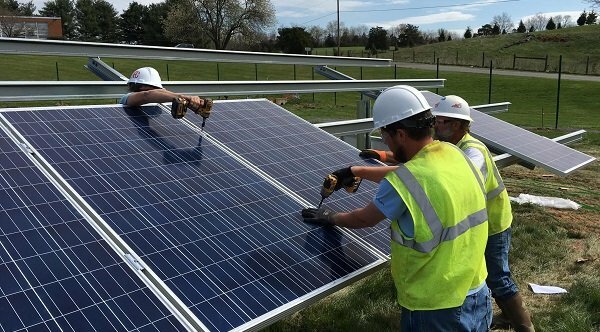 While Solar United Neighbors is still new in Pennsylvania, we have a proven track record of fighting for community solar in states like Maryland. Watch the webinar below to hear about lessons learned from our experience creating a community solar pilot program for Maryland and how we can help bring this innovated clean energy program to the Keystone State. You can download the presentation slides here.